In June 1986, Sadiq al Mahdi formed a coalition government with the Umma, the DUP, the NIF, and four southern parties. Unfortunately, however, Sadiq proved to be a weak leader and incapable of governing Sudan. Party factionalism, corruption, personal rivalries, scandals, and political instability characterized the Sadiq regime. After less than a year in office, Sadiq al Mahdi dismissed the government because it had failed to draft a new penal code to replace the sharia, reach an agreement with the IMF, end the civil war in the south, or devise a scheme to attract remittances from Sudanese expatriates. To retain the support of the DUP and the southern political parties, Sadiq formed another ineffective coalition government. Instead of removing the ministers who had been associated with the failures of the first coalition government, Sadiq al Mahdi retained thirteen of them, of whom eleven kept their previous portfolios. As a result, many Sudanese rejected the second coalition government as being a replica of the first. To make matters worse, Sadiq and DUP leader Mirghani signed an inadequate memorandum of understanding that fixed the new government's priorities as affirming the application of the sharia to Muslims, consolidating the Islamic banking system, and changing the national flag and national emblem. Furthermore, the memorandum directed the government to remove Nimeiri's name from all institutions and dismiss all officials appointed by Nimeiri to serve in international and regional organizations. As expected, antigovernment elements criticized the memorandum for not mentioning the civil war, famine, or the country's disintegrating social and economic conditions. In August 1987, the DUP brought down the government because Sadiq al Mahdi opposed the appointment of a DUP member, Ahmad as Sayid, to the Supreme Commission. For the next nine months, Sadiq and Mirghani failed to agree on the composition of another coalition government. During this period, Sadiq moved closer to the NIF. However, the NIF refused to join a coalition government that included leftist elements. Moreover, Turabi indicated that the formation of a coalition government would depend on numerous factors, the most important of which were the resignation or dismissal of those serving in senior positions in the central and regional governments, the lifting of the state of emergency reimposed in July 1987, and the continuation of the Constituent Assembly. Because of the endless debate over these issues, it was not until May 15, 1988, that a new coalition government emerged headed by Sadiq al Mahdi. Members of this coalition included the Umma, the DUP, the NIF, and some southern parties. As in the past, however, the coalition quickly disintegrated because of political bickering among its members. Major disagreements included the NIF's demand that it be given the post of commissioner of Khartoum, the inability to establish criteria for the selection of regional governors, and the NIF's opposition to the replacement of senior military officers and the chief of staff of the executive branch. In November 1988, another more explosive political issue emerged when Mirghani and the SPLM signed an agreement in Addis Ababa that included provisions for a cease-fire, the freezing of the sharia, the lifting of the state of emergency, and the abolition of all foreign political and military pacts. The two sides also proposed to convene a constitutional conference to decide Sudan's political future. The NIF opposed this agreement because of its stand on the sharia. When the government refused to support the agreement, the DUP withdrew from the coalition. Shortly thereafter armed forces commander in chief Lieutenant General Fathi Ahmad Ali presented an ultimatum, signed by 150 senior military officers, to Sadiq al Mahdi demanding that he make the coalition government more representative and that he announce terms for ending the civil war. On March 11, 1989, Sadiq al Mahdi responded to this pressure by dissolving the government. The new coalition had included the Umma, the DUP, and representatives of southern parties and the trade unions. The NIF refused to join the coalition because it was not committed to enforcing the sharia. Sadiq claimed his new government was committed to ending the southern civil war by implementing the November 1988 DUP-SPLM agreement. He also promised to mobilize government resources to bring food relief to famine areas, reduce the government's international debt, and build a national political consensus. Sadiq's inability to live up to these promises eventually caused his downfall. 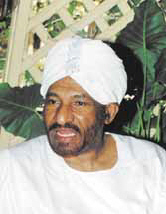 On June 30, 1989, Colonel (later Lieutenant General) Umar Hassan Ahmad al Bashir overthrew Sadiq and established the Revolutionary Command Council for National Salvation to rule Sudan. Bashir's commitment to imposing the sharia on the non-Muslim south and to seeking a military victory over the SPLA, however, seemed likely to keep the country divided for the foreseeable future and hamper resolution of the same problems faced by Sadiq al Mahdi. Moreover, the emergence of the NIF as a political force made compromise with the south more unlikely.